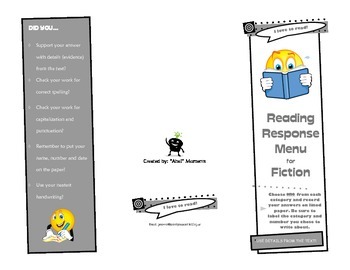 This Reading Response Menu for Fiction is presented in a brochure style. The directions are to chose one option from each category (Appetizer, Entree, Dessert) and record answers on lined paper. Typically, I would give my students a week to complete this activity. It is meant to be a homework assignment as we require our students to do 15-20 minutes of reading each night. The Reading Response Menu is a way to make them accountable for this reading.